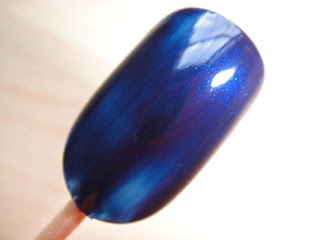 Blue Satin (461) was a really hot shade from Chanel’s 2008 Spring Collection. A lot of celebrities were wearing it and at that time it was sold out everywhere. Being a Limited Edition item, the price rocketed to over 60 bucks on ebay when it was originally sold for 19. But luckily, Chanel didn’t discontinue it and you can still purchase it at Chanel counters and online, for a raised price $23 though. Anyway let’s look at some pictures. There’s nothing to talk about the packaging. It’s the same nail polish packaging as others. The color looks pretty “blue” in the bottle. I haven’t used it for a while and to my surprise the texture got a lot thicker than I first opened it. It’s a little hard to apply and with one coat the coverage is not perfect. 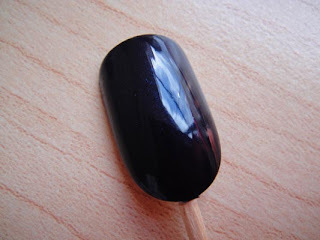 With two coats the color turned really dark, almost as dark as black. 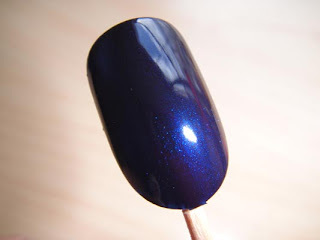 Under the sunlight, the fine blue shimmer shows up and the finish is more satin-y. With flash, the shimmers are more visible. It’s really pretty this way. The color is a little darker than it shows in the bottle. I think this is a really classy and elegant color that will last years after years. 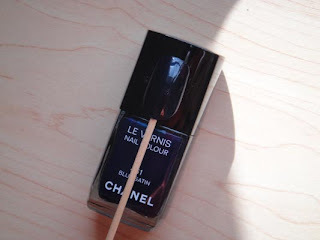 Maybe that’s also the reason Chanel still carries this color even though it’s a LE. 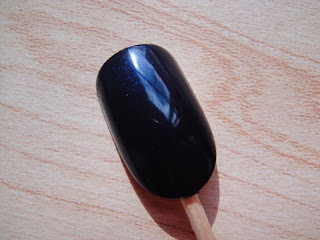 It’s about time for some rich deep nails again. awww. I like this color!